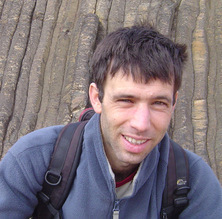 Gideon Rosenbaum's research interests are in the fields of structural geology and tectonics. He is particularly interested in the geodynamics of convergent plate margins and lithospheric extension. BSc, Hebrew University, 1997; MSc, Hebrew University, 1999; PhD, Monash University, 2004. Reply to comment by Offler et al. on "Does the Manning orocline exist? New structural evidence from the inner hinge of the Manning Orocline (eastern Australia)"
Rosenbaum, Gideon (2012) Oroclines of the southern New England Orogen, eastern Australia. Episodes, 35 1: 187-194. Rosenbaum, Gideon (2008) Tectonics of the Western Mediterranean and North Africa. The Australian Geologist, 147 34-35. Rosenbaum, G. and Lister, G. S. (2002) Reconstruction of the evolution of the Alpine-Himalayan Orogen: An introduction. Journal of the Virtual Explorer, 8 1-2. Holm, R. J., Rosenbaum, G., Richards, S. and Spandler, C. (2015). Disparate tectonic settings for mineralisation in an active arc, Eastern Papua New Guinea and the Solomon Islands. In: Proceedings of PACRIM 2015. PACRIM Congress 2015, Hong Kong, China, (1-6). 18-21 March 2015. Finzi, Yaron, Mohajeri, Arash, Muhlhaus, Hans, Singh Virk, Akashdeep and Rosenbaum, Gideon (2012). The initiation of rifting: interaction between melt and shear bands in pure shear extension. In: Proceedings of the 34th International Geological Congress 2012. 34th International Geological Congress Australia 2012 (IGC), Brisbane, Australia, (486-486). 5-10 August 2012. Rosenbaum, Gideon, Regenauer-Lieb, Klaus, Weinberg, Roberto, Finzi, Yaron and Mühlhaus, Hans (2011). Continental rifts: Complex dissipative patterns from simple boundary conditions. In: Geophysical Research Abstracts. EGU General Assembly 2011, Vienna, Austria, (). 3-8 April 2011. Rosenbaum, Gideon (2010). A subduction model for the formation of the New England Oroclines. In: Earth Systems: change, sustainability, vulnerability. AESC 2010, Canberra, ACT, Australia, (183-184). 4-8 July 2010. Rosenbaum, G. (2010). Oroclinal bending in the southern New England Orogen, Eastern Australia. In: J. D. Eccles, M. R. Grigor, P. W. O. Hoskin and D. C. H. Hikuroa, GeoNZ 2010 abstract volume. GeoNZ 2010 - Joint Meeting Including: The Geoscience Society of New Zealand The New Zealand Geothermal Workshop Day in common with the New Zealand branch of AusIMM, Auckland, New Zealand, (243-243). 21-24 November 2010. Li, Pengfei and Rosenbaum, Gideon (2010). Structural evolution of the Texas Oroclines: field observations from the hinge zone (Mosquito Creek, South East Queensland). In: Earth Systems: change, sustainability, vulnerability. AESC 2010, Canberra, ACT, Australia, (318-319). 4-8 July 2010. Li, Pengfei and Rosenbaum, Gideon (2010). Structural observations from the hinge of Texas Orocline. In: Soloman Buckman and Phillip L Blevin, NEO 2010 Conference Proceedings. New England Orogen 2010, University of New England, Armidale, New South Wales, (218-223). 16-19 November 2010. Rosenbaum, Gideon (2010). Structure of the New England Oroclines. In: Soloman Buckman and Phillip L. Blevin, NEO 2010 Conference Proceedings. New England Orogen 2010, University of New England, Armidale, New South Wales, (297-302). 16-19 November 2010. Regenauer-Lieb, K., Karrech, A., Schrank, C., Fusseis, F., Rosenbaum, Gideon and Weinberg, R. F. (2009). A novel thermodynamic framework for multi-scale data assimilation: First applications from micro CT-scans to meso-scale microstructure. In: AGU Fall Meeting 2009 Abstracts. 2009 AGU Fall Meeting, San Francisco, CA, U.S.A., (MR44A-02-MR44A-02). 14-18 December 2009. Weinberg, Roberto F., Regenauer-Lieb, Klaus and Rosenbaum, Gideon (2009). Dynamic rheology and strength of the lithosphere. In: Geodynamics of the Australian Plate: Abstract Volume. Geodynamics of the Australian Plate Research Meeting: Geology, Geophysics, Hazards & Resources, Caulfield, VIC, Australia, (21-21). 8 - 9 June 2009. Rosenbaum, Gideon, Regenauer-Lieb, K. and Weinberg, R. F. (2009). Interaction between mantle and crustal detachments: A non-linear system controlling lithospheric extension. In: AGU Fall Meeting 2009 Abstracts. 2009 AGU Fall Meeting, San Francisco, CA, U.S.A., (T31F-06-T31F-06). 14-18 December 2009. Rosenbaum, Gideon, Regenauer-Lieb, Klaus and Weinberg, Roberto F. (2009). Interaction between mantle and crustal detachments: a non-linear system controlling lithospheric extension. In: The 17th Deformation Mechanisms, Rheology and Tectonics 2009 Martin Casey Memorial Meeting: Abstract Volume. DRT 2009: Deformation, Rheology & Tectonics 2009, Liverpool, U.K., (136-136). 7-9 September 2009. Regenauer-Lieb, Klaus, Fusseis, Florian, Karrech, Ali, Poulet, Thomas, Weinberg, Roberto and Rosenbaum, Gideon (2009). Multi-scale earth system dynamics. In: 17th Deformation Mechanisms, Rheology and Tectonics 2009 : Abstract Volume. 17th Deformation Mechanisms, Rheology and Tectonics 2009, Liverpool, U.K., (133-133). 7-9 September 2009. Rosenbaum, Gideon (2009). Tectonic response to anomalous subduction and arc-continent collison. In: Martin S. Norvick and Stephen J. Gallagher, Selwyn Symposium 2009 : Origin of the Australian Highlands. Selwyn Symposium 2009, Australia, (118-118). 24 September 2009. Rosenbaum, Gideon, Regenauer-Lieb, Klaus and Weinberg, Roberto F. (2009). The role of mantle and crustal detachments during lithospheric extension: Implications for the evolution of the Australian Plate. In: Geodynamics of the Australian Plate: Abstract Volume. Geodynamics of the Australian Plate Research Meeting & Workshops: Geology, Geophysic, Hazards & Resources, Caulfield, VIC, Australia, (13-13). 8-9 June 2009. Weinberg, R. F., Regenauer-Lieb, K. and Rosenbaum, Gideon (2009). Thermal self-regulation of continental strength. In: Eos Transactions, AGU, 2009 Fall Meeting. AGU 2009 Fall Meeting, San Francisco, CA, U.S.A., (T31F-05-T31F-05). 14-18 December 2009. Nuriel, P., Weinberger, R., Rosenbaum, G., Golding, S. D., Zhao, J. X., Bar-Matthews, M., Uysal, I. T. and Gross, M. R. (2009). Timing and mechanism of calcite-filled vein formation in a contractional strike-skip setting, the Dead Sea fault. In: David Barrell and Andy Tulloch, Joint Geological and Geophysical Societies Conference, 2009 Programme & Abstracts. Geological Society of New Zealand Annual Conference, Oamaru, New Zealand, (160-160). 23-27 November 2009. Rosenbaum, Gideon and Giles, D. (2008). Geodynamics of giant porphyry ore deposits. In: Suzanne D. Golding, Gideon Rosenbaum and Paulo M. D. Vasconcelos, PACRIM Congress 2008. The Pacific Rim: Mineral Endowment, Discoveries and Exploration Frontiers. Extended Abstracts. PACRIM Congress 2008, Gold Coast, QLD, Australia, (283-287). 24-26 November, 2008. Rosenbaum, G., Gasparon, M., Lucente, F. P., Peccerillo, A. and Miller, M. S. (2008). Kinematics and magmatism of slab tear faults. In: 2008 Western Pacific Geophysics Meeting, Cairns, Australia, (). 29 July - 1 August 2008. Rosenbaum, G., Gasparon, M., Lucente, F. P., Peccerillo, A. and Miller, M. S. (2008). Kinematics of slab tear faults during subduction segmentation and implications for Italian magmatism. In: 33rd International Geological Congress, Oslo, Norway, (). 6-14 August 2008. Rosenbaum, G, Giles,, Betts,, Saxon,, Weinberg, and Duboz, (2006). Formation of ore deposits triggered by aseismic ridge subduction. In: Australian Earth Sciences Convention 2006 - Convention Handbook. GSA 18th Australian Geological Convention & ASEG 18th Int. Geophysical Conference, Melbourne, Australia, (). 2 - 6 July 2006. Rosenbaum, G, Regenauer-Lieb, and Weinberg, (2006). Geodynamics of core complexes: Bridging the gap between continental passive margin and oceanic detachments. In: Eos Trans. AGU. AGU Fall Meeting 2006, San Francisco, USA, (). 9 - 15 December 2006. Weinberg, R. F., Rosenbaum, G. and Regenauer-Lieb, K. (2006). Thermo-mechanical modeling of continental extension: The transition from core complexes to rigid block faulting. In: Australian Earth Sciences Convention 2006 - Convention Handbook. GSA 18th Australian Geological Convention & ASEG 18th Int. Geophysical Conference, Melbourne, Australia, (). 2 - 6 July 2006.